If you have ever been to Italy, you will instantly know about Italian Limoncello. Lemons are one of the most important staples in the food of Sorrento, Italy. They have long been a staple in the region along the Italian Amalfi Coast in Capri and Sorrento. Because of this, the city’s most famous product is their famous Italian Limoncello. Families in Italy have passed down recipes for generations, as every Italian family has their own Limoncello recipe. In fact, this lemon drink is now considered the national drink of Italy and can be found in stores and restaurants all over Italy. This lemon drink is wonderful as a palate cleanser or as an after-dinner drink. It is always served well chilled in the summer months. Store your bottles of Limoncello in the freezer until ready to serve. The ingredients are simple and few, and making a batch does not require much work, as it needs to steep for (80) eighty days. * When choosing lemons you want to use organic if possible. They won't have wax and pesticides on the peel. Choose thick-skinned lemons because they are easier to zest. The lemons must be yellow and not tinted with green. Carefully zest the lemons with a zester or vegetable peeler so there is no white pith on the peel. Use only the outer part of the rind. The pith, the white part underneath the rind, is too bitter and would spoil your limoncello. Check out my web page on How to Zest Lemons. In a large glass jar (1-gallon jar with lid), add vodka. Cover the jar and let sit at room temperature for at least (10) ten days and up to (40) days in a cool dark place. The longer the mixture rests, the better the end taste will be. There is no need to stir - all you have to do is wait. As the limoncello sits, the vodka slowly take on the flavor and rich yellow color of the lemon zest. Add cooled sugar mixture to the Limoncello mixture (from Step One). Cover jar and allow to rest for another 10 to 40 days. After the rest period, strain the Limoncello; discarding the lemon zest. NOTE: Coffee filters or cheesecloth work great for straining the mixture. Moisten the filters before beginning the straining process. Pour strained Limoncello in bottle/bottles (of your choice) and seal tightly. Keep your bottle/bottles of Limoncello in the freezer until ready to serve. Serve ice cold from the freezer. Refreshing and light, it is wonderful as a palate cleanser or as an after dinner drinks. It is an incomparable digestive, and with tonic water it is a sweet, tasty refreshment. Itis also great with champagne or mixed with juice as a cocktail. t even does well simply drizzled on ice cream, fruit salads, or fresh strawberries. I put 150 grain alcohol 90 proof can I use this? Or do I have to go buy vodka? You can use the 150-grain alcohol. Your end result could be very strong and you might need to dilute it. Let me know how you Limoncello turns out. I am sorry, but I do not have that recipe. I have a recipe for creamy limoncello if you still need it. It’s from an Italian lady outside Milan. If you still need it, I’ll dig it out. I would love your recipe for the creamy version of Lemoncello.I sampled it in Sorrento when in Italy in 2011 and have been making the clear one ever since and would love to do a batch of cream Lemoncello as well . I have not tasted or made a creamy version of limoncello. Maybe some of the readers can help you. Soooooo, did anyone ever post the crema di Limoncello recipe or no? Can I have it? Janet, I’d love it if you’d post your creamy limoncello recipe!! I would love the crema limoncello plz. I’m sorry, but you just can not make true Italian Limoncello without the zest of fresh lemons. Our lemon tree has a bumper crop of meyer lemons. They are thinner skinned than others we’ve received over the years. I want to make lemoncello however is there a way to cut the sugar or use a substitute? You can cut the sugar down, if you desire. I do not think I would use a sugar substitute. Hi! I want to make this for an event but only have 49 days. Is that sufficient or am I setting myself up for a ‘ not so great’ lemoncello? For excellent lemoncello, please follow the recipe. Why do commercial lemoncellos appear translucent/opaque/cloudy but no fines are floating and mine is transparent? Definitions: Something that is transparent lets all light through without distorting the image. It is as if the transparent object were not even there, visually speaking. Something that is translucent lets some but not all light through. Something that is opaque lets no light through. 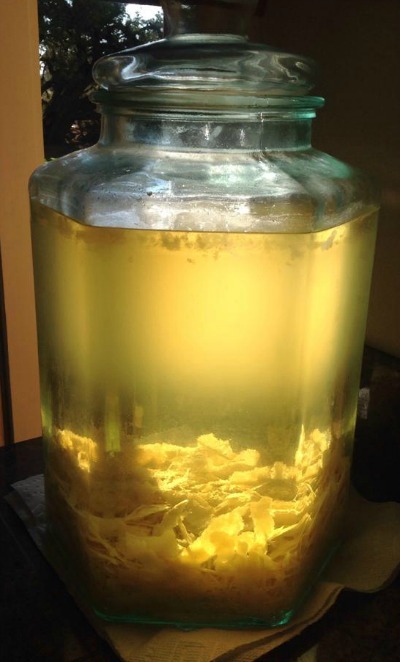 Because the limoncello is strained before bottling, this creates a transparent limoncello. I mistakenly did not allow the simple syrup to cool to room temp. When I added it to the Vodka lemon zest mixture the whole batch turned cloudy and remained this way even after straining. I found no difference in the taste. I have notice that the commercially produced varieties are cloudy. My theory is that this must be part of the pasteurization process causing a cloudy mixture. I make large quantities of lemoncello. (four bottles of Everclear 150 proof) I use 25 meyer lemons per bottle. I use a micro-plane to zest the lemons and let the mixture sit for at least 40 days. I begin the simple syrup mixture at a ratio of 1 cup sugar to 1 1/4 cups water per bottle of Everclear and alter to taste. After another 40 days I strain and bottle the lemoncello. The finished product is worth the wait. Are you saying you use 25 lemons per bottle of everclear – so if you use 4 bottles of everclear you are using 100 lemons? A friend highly recommend this recipe. We have hundreds of lemons on our backyard lemon tree. Another friend and I are going to make this for her summer wedding. My question is: after it rests for all of that time does it have to go in the freezer or can I put it in the freezer as we need it. Storage in the freezer is a problem. For drinking you want to store either in the refrigerator or freezer. Because of the amount of liquor in the limoncello, it should not spoil if stored at room temperature. This sounds so good….but I need a non alcoholic version. Is there any such thing that would be yummy and not be zesty lemonade? Thanks! It would not be Limoncello if the recipe did not contain alcoholic. I have the mixture with the simple sugar steeping now…LimoncelloQuest and a good friend that tracks his batches gave me the inpsiration and “ideal” blend of liquor/lemon/sugar. I sure hope so, the wait is driving me crazy. I strained before adding the simple sugar per the other recipe. I figured straining the sugar would be sort of a sticky mess. I hope this wasn’t a horrible mistake. Fingers crossed. I just bottled my batch and strained it at the end. It was not sticky or a problem to do. I am curious how yours turned out straining it first since mine had the additional 40 days of steeping. I only have 2 smaller glass bottles, can I half the recipe and make 2 batches , one in each jar? Can I use a plastic container to store? I would not use plastic containers for storing. Please use glass containers. I store my limoncello in small bottles in the freezer. Small bottles also make for great gift giving. Does the finished product need to be kept at room temp or can it be kept in the freezer? Please store in the freezer. It should be good! Open it up, smell it, and then take a taste. You be the judge! When I wintered in Arizona, I had a magnificent lemon tree of unknown parentage that produced more lemons than all my friends could use. We had “grate” parties (actually we used microplanes, but grate sounds better), and gave away naked lemons to neighbors. Gosh I miss that tree! If my lemons weren’t ready when I was, I found that grapefruit zest is almost as good. No, it is as good, just different, but I don’t have a name for it. Now I have to settle for Costco bags of lemons. I allow the zest to steep for forty days, and then after adding sugar water, to rest for forty nights. Forty days and forty nights sounds almost biblical. We are having difficulty trying to find 100 proof Vodka. Is Ever Clear the same thing as 100 proof Vodka? Please do not use Everclear, as that proof will be too strong. I would recommend instead to use the highest proof vodka you can find. Everclear differs from vodka only because the distillation for vodka attempts flavor characteristics(ig:copper pot;use of corn,rye,potatos etc.). Any amounts discussed here are approximations fitting for our purpose . The Authors recipe yields 28% alcohol content , some go much higher. To achieve 30% using mixture of 80 proof vodka/everclear 95%: 5 cups (40 oz)vodka/1 1/4 cups(10 oz) everclear in lieu of 2-750ml 100 proof vodka. This recipe sounds yummy. I would love to try it out; however, I am quite the novice. I know how to can but I have not ever attempted this type of recipe. So please bare with me with my questions. Am I to understand you only use the lemon zest and not the juice? If so, what you do with all the juice? There’s a lot of flavor and color in the lemon zest that will impart into the vodka. You could freeze the lemon juice in ice trays, then store in resealable freezer bags and use for cooking, make some wonderful lemonade or lemon drop martinis. I freeze my lemon juice then in summer I make Strawberry Lemonade Concentrate for the kids to enjoy while the adults enjoy the Limoncello. Another question: Do you keep the mixture in the freezer during the waiting periods or do you only store the finished product in the freezer? Only store the finished product in the freezer. I started my limoncello and put it away in a dark cupboard. Forgot about it! Now it has been sitting there for about 2 or 3 years. Do I throw it away or can I make anything out of this mistake? I think you need to taste it to see if it is ok or not. Remember there is alcohol in it and it may be fine. I’m replying to Diane Hopper about forgetting about your limoncello for 2-3 years. I had some that was several years old and it was delicious. I sure hope you didn’t throw it away! I would just transfer it to the freezer. I’m making my first batch after not having made some for a few years. I’m about to move onto the step of adding the sugar mixture. I can’t wait for the finished product! Salute! What kind of vodka do you prefer. Should i use the whole bottle of vodka. You say cover the jar. Do you mean with cheesecloth and a rubber band or seal with a lid? Cover with a lid that can be sealed closed. Can I mix two different brands of 100 proof vodka? This recipe for Italian Limoncello is fantastic! Congratulations!! It’s very similar to the taste of pepegusto Limoncello! Where do you get your bottles? Are corked ok, or swing tops better? You can look online at Amazon or a local home brewing supply store. Would it be any different when using pure alcohol? Better/worse from vodka. I’ve always made it with pure alcohol and its delicious. I,personally, have never made orangechello. Oh , the orange sounds great ! How did it turnout ? I only use Everclear proof 150 for all my “Cello” recipes. I make Lemoncello, Orangecello (with blood oranges) and Clemencello (with Clementines because I love the smell of the zest, and this is actually my favorite).. I use the exact same recipe, but use organic fruit whenever possible….It is ALL Amazing!!!!! We bought a chest freezor for just our “Cello’s”! What kind of lemons do you suggest do they have to be Meyer what would be better? Use lemons with a thick yellow skin. If I don’t have tons of freezer space how long will this be good if just in the refridgerator once sugar/water mix added? How long on the shelf? Also wondered, can you keep the lemon in vodka in a dark cupboard for longer than 80 days and just make batches as needed? Has any one tried the recipe with stevia rather than sugar? So, I’ve strained my limoncello (thru 4 layers cheesecloth and fine seive) into the bottles, but have noticed that I still have “floaters” suspended in it. Any ideas for further straining? Am I doing something wrong? I’ve been super careful. Michelle, you can make homemade, sugarfree syrup with Swerve or other sugar substitute. Lots of sf syrup recipes on line. I decided to make this recipe. Made a couple of mistakes but it’s still delicious. I used 80 proof vodka and let peel sit in the vodka for over 60 days. After filtering and bottling it I stored it in the freezer where it froze solid. Perhaps if I’d used 100 proof vodka the higher alcohol content may have prevented it from freezing. But it is delicious! Thanks for the recipe.